Hello and welcome to design-birdy.com Today we would like to share with you an article with a step by step instructions about crocheting this super cute sunflower sachet bag that you can see on the photos. The sachet bags are very easy to crochet and this one is one of the easiest, trust me. Plus the instructions are great, there is a video tutorial and a written pattern too, so that means that you are not going to face any kind of a problem or misunderstanding while working on this project and trust me the result will be amazing. The sachet instructions are separate from the sunflower instructions so I think that you need some instructions for the sunflower too. 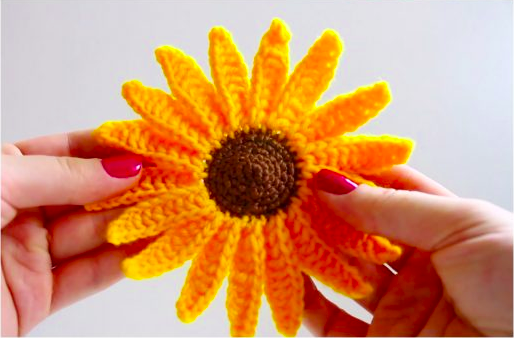 No worries… Here is a link that guides us to the article about the crochet sunflower that is presented on the photos ( Crochet Sunflower) . The sunflower instructions are great too, they include the pattern and the step by step video tutorial too. The crochet sunflower is attached to the sachet after finishing both crochet projects. I am sure that you are going to have a great time working on this project.